Composers: John Lennon; Paul McCartney. Personnel: George Harrison (guitar); Alan Civil (horns); Paul McCartney (bass guitar); Ringo Starr (drums); Anvil Bhagwat (tabla). Audio Mixer: Peter Bown. Audio Remasterers: Sean Magee; Sam O'Kell; Steve Rooke; Guy Massey; Paul Hicks. Liner Note Authors: Dan Davis; Derek Taylor; Mark Lewisohn; Alan Rouse; Dan Davis; Kevin Howlett; Tony Barrow; Peter Blake. Author: Paul McCartney. Director: Bob Smeaton. Editor: Julian Caidan. Photographers: Iain Macmillan; Bruce a. Karsh; Ethan Russell; Robert Freeman; Ian MacMillan; Michael Cooper. The Beatles always stood apart from their peers, a self-evident statement that sadly extended to the treatment of their catalog in the digital age. Where all their contemporaries from the Byrds to the Who have had their catalogs remastered and reissued in deluxe editions, sometimes several times, the Beatles remained stuck in the early days of digital, their 14 albums plus PAST MASTERS singles collections remaining untouched since 1987. The 2009 reissue campaign corrects almost all the problems of the original 1987 CDs: the sound and artwork are improved, and all the original mono and stereo mixes finally see the light of day. 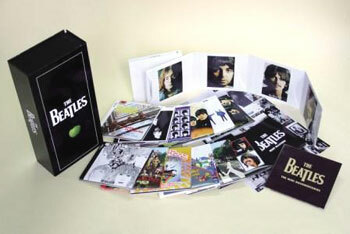 Naturally, it's possible to quibble about some details of the presentation, particularly the decision to split the reissue into two separate box sets, one covering the stereo mixes and one the mono mixes, with only the stereo mixes available as individual discs but both boxes still constitute the best Beatles by far. Crucially, it's also inarguably the best-sounding Beatles music ever released, robust and rich even on the earliest rock & roll. None of the albums have been remixed--although HELP! and RUBBER SOUL retain George Martin's 1987 mixes, the original stereo mixes being bonuses on the mono set--so this doesn't shock the way the YELLOW SUBMARINE soundtrack did with its reimagined stereo mix. Nevertheless, these remasters surely do surprise with their clarity and depth, with each album feeling bigger and fuller than the previous CD incarnation, but not artificially so. It's not that these are pumped up on digital steroids; it's that the veil has been lifted, so everything seems full and fresh. Appropriately, there's more to savor from HELP! onward, as the Beatles' productions grew ambitious, but PLEASE PLEASE ME, WITH THE BEATLES, and A HARD DAY'S NIGHT all have a strong punch, while BEATLES FOR SALE is warmer than the previous disc. As a package, the stereo box is slightly unwieldy--it's a large, vertical set with two stacks of discs in slick cardboard sleeves piled on top of each other. No extra book is included with the set, but each disc has its own booklet with dry, straightforward liner notes detailing the recording process instead of analyzing the music. Nevertheless, these do offer annotation, something sorely lacking from the first CDs, and they do replicate the original notes--in the case of MAGICAL MYSTERY TOUR, including the entire storybook; in the case of SGT. PEPPER'S, all the 20th anniversary annotation is added-- finally bringing the Beatles to the same standard for reissues that every other major (and most minor) bands have had for years now. And the story, at least for the stereo box, is not the packaging --it's the glorious sound that makes this such a treat. There's also no question that those who waited 22 years to hear a better version of the Beatles will not be disappointed (although they may still wonder why it took so long for the Fabs to be treated as they deserve).